A square chambered cairn on remote moorland on the south flank of Unival (Uineabhal) hill, North Uist (Uibhist a Tuath). 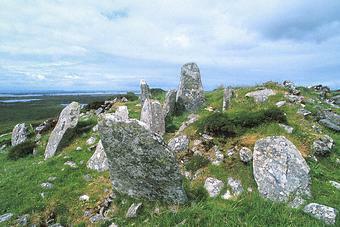 The most striking features are the five tall uprights slabs marking the cairn façade. They increase in height towards the centre, where a narrow passage leads to the central chamber. The chamber, now roofless, measures about 1.8m x 2.2m and is polygonal in shape. The cairn is low and roughly square, 16.1m each side. Some of its kerb-stones are still in situ with drystone walling between them. Excavations in 1935 and 1939 produced two inhumations, a lot of pottery and a stone ball. To the north-east of the cairn there are the remains of an Iron Age house. To the south-west is a 3m tall standing stone.